A new communication process in the emergency department helped the hospital reduce the time it took a patient to get to their new unit by almost half an hour. Bed turnover is important, both to the hospital and the patient. Consumers need to be treated by clinicians at the appropriate level of care as soon as possible, and hospitals depend on operational efficiency for their financial wellbeing. Arnot Health, a 475-bed health system located in southern New York State, knew that improving the door-to-floor time was critical to its commitment to quality patient care. After implementing a secure texting platform in its emergency department, the hospital was able to reduce "door-to-floor" time there by 36 percent. "We recognized an opportunity in the admissions process to greatly improve patient and staff satisfaction by eliminating the old school way of handling admissions and embracing a more mobile approach," said Mike Connor, director of business information systems at Arnot Health. "The need was greatest in our emergency department," he explained. "The amount of time it was taking to align all the appropriate resources was causing delays, and nobody wants to sit in an ER longer than they need to." The health system already had been using secure texting technology from QliqSOFT for general secure texting purposes throughout the organization. "We didn't have to look to another third party or sink costs into yet another product," Connor said. "Saving money was another way we were able to be good stewards of our resources. A lot of places throw money or people at a problem in an effort to fix it when those costs can be avoided by leveraging existing solutions in exciting new ways." There's a sizable market for secure texting systems. Vendors of this technology include DrFirst, Halo Communications, Imprivata, OnPage, Telmediq, TigerConnect and Voalte. 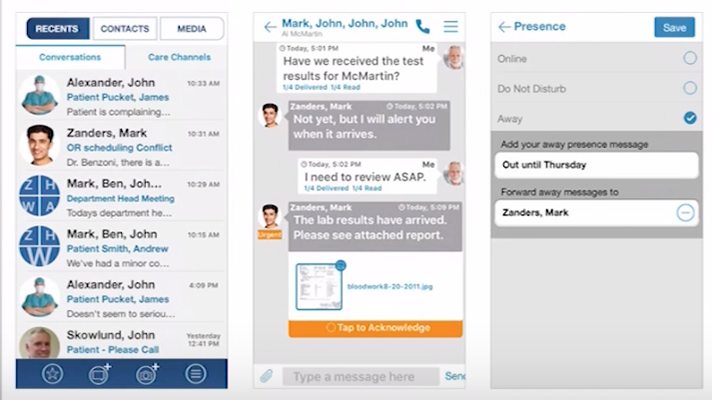 At Arnot Health, when the decision to admit is made, a unit secretary will initiate a secure group text message with an admissions team in the QliqSOFT tool. This group of hospital staff comprises representatives from all of the necessary departments such as environmental services, bed board, directors of nursing and others. This text kicks off a collaborative conversation among the users who then can coordinate all of the requirements and get the patient roomed in a timely manner. "Emergency departments are fast-paced places, and that's the way you want it," Connor said. "As a patient, you don't want your nurses and physicians wrapped up in phone calls and admission processes – you want them taking care of you. You don't want to hear that your room upstairs has been ready for a while but we have to keep you down here until they find a nurse." When a provider in the emergency department decides that a patient's condition warrants a different level of care, the patient needs to be able to trust that staff are making moves toward that end as quickly and efficiently as possible. Connor said implementing the new communication process in the ED helped the hospital reduce the time it took a patient to get to their new unit by almost half an hour: from 119 minutes in 2017 to 73 minutes in early 2018. "Transfers happened more quickly and seamlessly, and we continue to see the metric improve every quarter," he said. Addressing the issue with turnaround times not only resulted in decreased door-to-floor times and improved patient care, it had the side effect of improving staff satisfaction, as well. Staff appreciate having a smooth and replicable process that's transparent and trackable, he added. Also, message delivery receipts gave them confidence that the appropriate recipients were actively engaging in the conversation and they no longer had to wait on missed and returned phone calls. "Message flagging and escalation options gave the participants in the conversation the ability to call out time-sensitive or critical items, and pre-formatted 'quick messages' reduced the redundancy of typing the same thing over and over," Connor explained.